This was a quick, and I mean quick, bingo game that I threw together for my students this morning. The only materials needed in order to play is a piece of paper and something to write with. Students made their own board by drawing a 3×3 grid on their paper. In each space, they chose a word from the SMART Board to write down. They did not have a free space. They used their board multiple times. Instead of placing markers on the space, they made a different symbol each time to represent each round. A very easy impromptu game that they loved to play! I made the file available for download in my store, Teacher Store 365. In order to use the file you will need SMART Notebook. The first slide was made using words from Rudolph the Red Nosed Reindeer. 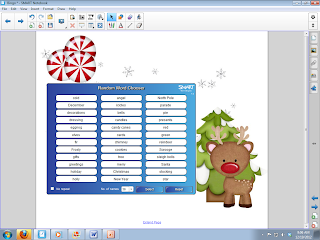 The second slide contains random words related to Christmas. Many of you may have the privilege of being on break by now, but for those of you that have the privilege of still being with your students here is an extra activity to get you and your students in the holiday spirit! !